While exposure to sunlight is thought to be a major cause of melanoma, the fact that Australian office workers have a higher incidence of melanoma than outdoor workers on the parts of the body that are usually covered suggests that we must all be cautious. 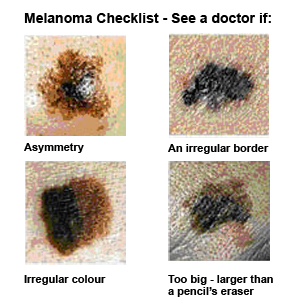 Even if you were under cover this summer, now is a good time to get some melanoma “know how”. A growth that increases in size and looks pearly, translucent, tan, brown, black, red, pink, or multicolored. A mole that changes in color or in texture, takes on an uneven shape, gets larger, or is bigger than a pencil eraser. A spot or growth that continues to itch, hurt, crust, scab, fade, or bleed. An open sore that lasts for more than 4 weeks, or heals and then reopens. A scaly or crusty bump that is dry, rough, and pointed (sticks out like a horn) and may sometimes cause a pricking or tender feeling in the skin. Note that melanomas can occur anywhere, even under the finger or toenails. If you notice any of these changes on your skin, call to make an appointment as soon as possible..
Alternatively, since a thorough check involves searching the scalp and back, it may be wise to book a consultation where your doctor will assess and measure your moles and with regular checkups, help spot any changes or irregularities. Family doctors do this regularly.